Product Description: Starting in the early 1960s, Mopar Wedge engines powered a wide range of Chrysler muscle cars, such as the Dodge Charger, Daytona Charger, Super Bee, Challenger, as well as Plymouth Barracuda, Superbird, Road Runner, GTX, and others. Many times these high-powered muscle cars were pursued by equally high-powered Dodge and Plymouth police cars that were also packing Mopar big-block power under the hood. In 1978, the last of the Mopar big-blocks rolled down the production line, but in an odd twist of fate, the popularity of the Mopar surged again in street and strip cars during the 1980s. By the 1990s, the big Mopar engine was more popular than ever. This book covers how to build Mopar's 383-, 400-, 413-, 426-, and 440-ci engines to power levels of 600 to 900 hp. 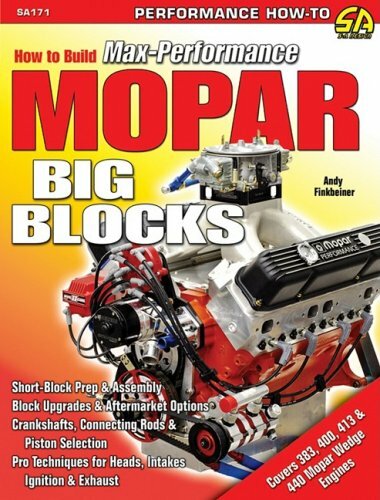 How to Build Max-Performance Mopar Big Blocks discusses how to properly budget your engine build for a specific performance target and how to select a stock or aftermarket block for the desired performance level. The reciprocating assembly (crankshaft, connecting rods, and pistons) is examined in detail, to help you select the right design and material for durability and performance requirements. Cylinder heads and valvetrain configurations are crucial for generating maximum horsepower and torque. This volume discusses all the stock modification options, the best setups, selecting the right machine work, the latest aftermarket head options for producing huge horsepower, and building stroker engines. The camshafts and lifters chapter compares and contrasts use of hydraulic flat tappet, hydraulic roller, and solid flat tappet cams. In addition, the book explains how to optimize fresh and spent fuel, discussing single- and dual-plane intake manifolds, as well as the exhaust-system design to optimize scavenging. The book also details engine builds at 600, 700, 800, and 900 horsepower levels to provide insight and reveal what can be done with real-world component packages.